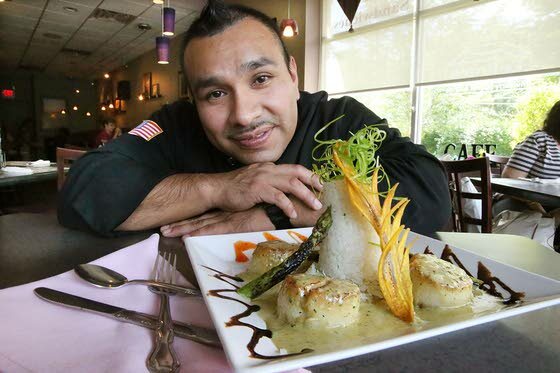 Chef Leo Sanchez displays his Pesto Parmesan Scallops at Celina’s Mulberry Market & Grille Cafe in Galloway Township. 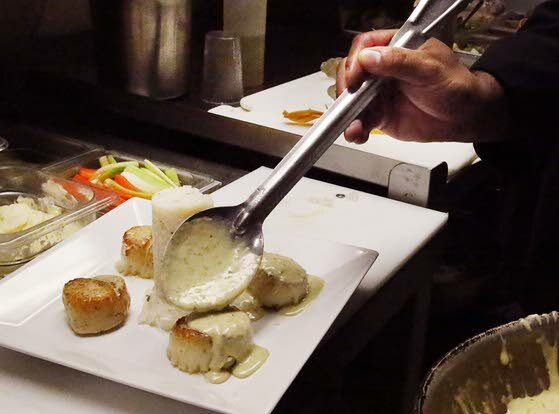 Sanchez tops his scallops with a cheesy, pesto sauce. Leo Sanchez is a chef who recognizes fresh when he sees it. Growing up in a small town called Putla in Oaxaca, Mexico, everything his mom cooked was from scratch using strictly fresh ingredients. Deciding on dinner was a family affair. When his mother would say, "All right, if you guys want to eat some chicken, just go get a chicken and I'll cook it for you," Sanchez could go out in the yard and pick out a chicken. His parents would dispatch the bird but from 10 years old, Sanchez knew how to pluck the bird and get it ready to be cooked. So did his four sisters and one brother. Now, as the executive chef at Celina's Mulberry Market & Grille in Galloway township, a position he has held for the past seven years, Sanchez applies the principles he learned at home about the importance of using the freshest ingredients available. "My parents instilled upon me at a very young age the importance of experiencing quality of food and that it is the essential ingredient to a healthy lifestyle," says Sanchez. Sanchez remembers watching his mother prepare food for the family and that is where he got his love for cooking. In 1994, Sanchez came to Atlantic City where some family members already lived, not knowing where his journey would take him. "My culinary career began with various restaurants in Atlantic City," says Sanchez. "My dream was to become an executive chef one day." Armed with a background that included some classwork at Lincoln Culinary Institute in West Palm Beach, Fla., Sanchez got the chance to begin working with various executive chefs in the area. "At some point, I met my lifelong friend and mentor Chef Lou Macera, who took me under his wings so to speak," says Sanchez. "I can remember the day when Chef Lou said to me that I would be more than just a line cook and from that moment forward, my journey and future career as a chef began." Sanchez, like many in the business, started as a dishwasher and then worked as a prep cook, line cook, and sous chef. Sanchez finally got his chance at his first executive chef position at Grabel's Restaurant (later O'Grady's) in Atlantic City, where he worked until 2004. His next move was to Evo Restaurant at Trump Plaza where he served as executive chef until 2007, when he made the move to Celina's Mulberry Market and Grille in Galloway. "At Celina's we strive to make everything from scratch including our signature sweet potato black bean burger and the daily soups," says Sanchez. "I make vinaigrettes that are different from the norm which keeps the customers excited and coming back." Sanchez's signature vinaigrettes include avocado and cilantro; peach; mango and pineapple, just to name a few. Favorite garnishes include fried plantains, crispy fried sweet potatoes and homemade glazes such as beet glaze reduction and ginger miso. Like his mom, Sanchez prefers to use a lot of fresh herbs in his cooking and plenty of fresh vegetables such as string beans, zucchini and potatoes. Cumin and dried chilies, ancho and guajill peppers feature prominently in his cuisine, making his food spicy, but not necessarily "hot," preferring instead to allow the natural flavors of the food to dominate the dish. "I have to be careful with the amount of spice I use because a lot of people don't like spicy food," Sanchez says. His philosophy reflects the growing trend towards a healthier menu and down-to-earth lifestyle, offering nutritious meals while refusing to sacrifice flavor or variety for the sake of putting a meal on a plate. To that end, Sanchez likes to work with local farmers, seeking out the finest regional and local organic produce that makes his cuisine so special. Always challenging himself to do new things, when Sanchez steps into the kitchen, he can do more than cook the comfort foods of his youth. Instead, he uses his experience to come up with new creative plates. "To be a cook in a lot of different restaurants, I learned a lot of different dishes from everybody else," says Sanchez. Seafood is among the things Sanchez enjoys cooking the most, cooking shrimp, lobster and scallops with the same passion he has for life. One of his favorite fin fish to cook, Chilean sea bass, is so good, he reserves it for special occasions such as Mother's Day and Valentine's Day. The pesto parmesan scallops he developed has become one of his most requested dishes. His passion for good food includes creating a new dish and sharing it with friends. "Especially when I have a lot of compliments from the customers, it feels so good," says Sanchez. 11 a.m. to 3 p.m. Sundays. Dinner - 4 to 8 p.m. Mondays to Saturdays. Using a saute pan, add olive oil and heat until very hot. Add the seasoned scallops to the pan and allow to cook until golden brown, turning once. Add the butter to the pan halfway through cooking to achieve a nutty flavor on the scallops. Remove scallops from pan and reserve. In the same saute pan add the garlic, saute until translucent. Add the seafood broth and simmer for 15 minutes. Add heavy cream and cook for approximately 3 to 5 minutes on low heat. Add cheese, pesto sauce and fresh parsley. Serve with your favorite vegetables and jasmine rice. Rinse rice in a large bowl with cool water until water runs clear. Drain rice. Combine rice, coconut cream, salt and water in a medium saucepan. Bring just to a boil, then cover and reduce heat to low. Cook until rice is tender and liquid is absorbed, 40 to 45 minutes. Fluff rice with a fork. Cover and let rest for 20 minutes. Garnish with chopped cilantro. Place garlic in the bowl of a food processor and pulse until coarsely chopped. Add pine nuts, grated cheese, pepper and salt. Pulse to rough chop approximately 1 minute. Add basil and oil. Pulse 1 minute until smooth.